Helena Rubinstein famously said 'there are no ugly women, only lazy ones' and whilst I won't be so hard on myself to say I'm ugly I'm definitely one of the lazy ones. As I've expressed before, I've lacked a skincare regime for most of life and part of the reason for bringing beauty posts to my blog is a way of encouraging myself to put a skincare regime in place, make an effort with a bright lipstick occasionally and my mum is over the moon I'm now wearing mascara on a daily basis. 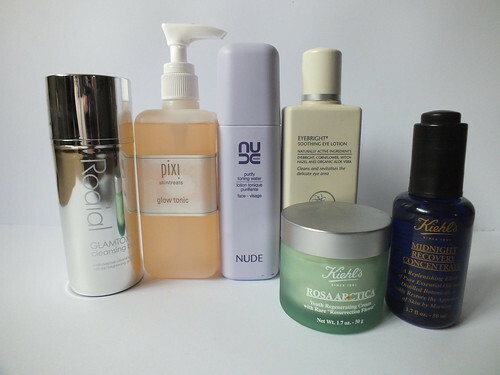 The biggest problem with reaching 34 without much knowledge of what skincare I should and shouldn't be using and slight spendaholic tendencies is that reading so many beauty blogger recommendations of the latest products I could quite happily go crazy. The only thing holding me back is wondering is this product even for me and secondly thinking, hang on I have a good 10 years on many of these bloggers, won't my needs be different? My first step into a regime was visiting Kiehls. I was open and honest about my laziness and lack of regime and walked away with a bank balance breaking bag of goodies but whilst products such as the Midnight Recovery Concentrate were a pleasure to use I didn't actually notice any difference than when I managed a swipe across my face with a flannel in the shower. Then my blog reading led me to straight talking skincare guru Caroline Hirons and suddenly she was saying things that completed went against what I'd been told by Kiehls. Er yes you do need to cleanse in the morning, er yes toner is important (so important we have two!). Everything she said made sense, phrases like putting your make up on without a skincare routine is like Picasso spending thousands on paints and throwing them at a brick wall was logical to me. Shortly after my discovery Caroline announced an opportunity to make appointments with her were to be announced and I decided if I was going to get the advice I wanted and needed then this was it. Not only did I have confidence she would tell me like it is there was also a slight chance I'd be too scared not to do what she advised! It's no surprise I was one of the lucky few who took a stroll down to Fortnum & Mason a couple of weeks ago having actually been one of the first emails received as I was sitting hitting the refresh button on my computer waiting for the details to be announced. I expected Caroline to take one look at my face and be horrified at what she saw but surprisingly considering the lack of care and attention I've given my face we deemed I was in pretty good shape. The biggest issue I have is I'm a smoker (yes I know and we agreed we both know how bad it was so we moved on!) and that leads to a number of blackheads on my face. Ignorantly it had never occurred to me that this would be the cause. She recommended I get regular facials making sure they include extraction. This little gem alone allowing me the knowledge I need when making appointments at salons. Rather than walking out with an extensive list of products Caroline recommended she asked what I already had and how I needed to use them, alternatives and other things I could look to. The main recommendation (after giving up smoking!) was a clay mask, something I'd not yet added to my arsenal. 'Clay is clay' so I could spend what I felt comfortable with and she provided two different priced products to investigate. I asked about add on products such as the Pore Refiner I'd recently purchased from Clinque and another Caroline Hirons gem 'pores aren't doors' was the response. I hadn't noticed any particular difference from using this product and when she explained that you can't close pores these products just enlarge the areas around them to disguise I knew the pore refiner was being disposed of as soon as I got home. We discussed supplements and then there was time for a bit of advice on the long haul flight I'll be taking in October and my time was up with the parting words, you look good now but you've about 5 years and then you'll look like a 40 year old smoker if you don't give up - now theres a scary warning! My advice to anyone reading this, if you have any skin concerns and the opportunity to have an appointment with Caroline do so or at the very least check out her blog and You Tube talks, you will learn so much. I'm lucky in that I have no major skin concerns but I firmly believe that my hour with Caroline has put my mind at rest that I don't need to be sucked into sales pitches from beauty counters on wonder creams and will save me a fortune in the long run. Hi though it's been months since your post I found it after emailing requesting a Skype appt with Mrs Hirons. I too am a smoker and am now 43 tho I'm blessed to look several years younger. Good genes as I've smoked now for twenty years :( I've never had acne breakouts etc tho wrinkles on forehead are bad after wearing glasses (no shades either) until I finally found contacts I could wear at age 34. At any rate I enjoyed reading about your appt and simply wanted to say I too share your smoking concerns, skincare concerns and look forward to securing hopefully an appt with her. I will check out the rest of your blog and hope to find an update on how your skin has been handling the new regime God bless from Mississippi in the US!